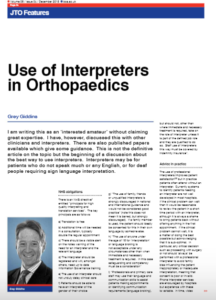 Written by Grey Giddens, an orthopaedic hand surgeon and Trustee of the BOA, this thought-provoking article (published in the Journal of Trauma and Orthopaedics) highlights some of the challenges inherent in conducting medical consultations via an interpreter and offers some practical advice. We recognise that these challenges can equally be applied to other therapeutic areas within the sphere of sports and exercise medicine and that they may have contract risk implications for SEM practitioners, especially related to consent in football and other professional sports. If the article raises any questions for you, or you would like to discuss the implications further, please do get in touch.